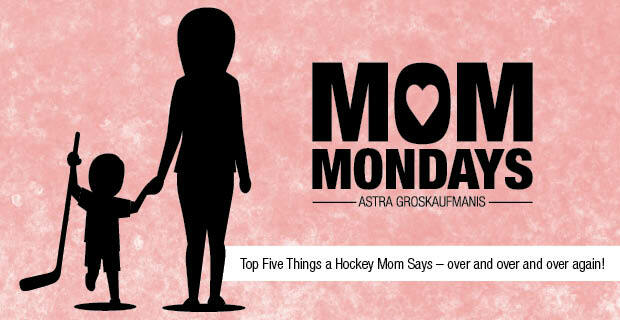 Mom Mondays: Top Five Things a Hockey Mom Says – over and over and over again! Why are you always the last one out of the dressing room? Getting dressed for a game, my kids make Usain Bolt’s 100-metre dash look like the work of a sloth. But the amount of time that it takes them to change out of their gear after a game? I think I could finish reading War and Peace while knitting all my future grandchildren’s baby blankets. I once offered to pay my son five dollars if he was one of the first five kids out of the dressing room. Not the first one out, but one of the first five. Five dollars wasn’t enough. Did you rinse your mouthguard? That critical piece of equipment that protects your dental work and may help prevent a concussion is a gathering place for germs. The better question is probably, “Did you put your mouthguard back in the case?” or even “Do you know where your mouthguard is?” Note: same script for water bottles. Hockey Moms should know better than to ask this but we do so over and over and over. Of course they packed everything! They remembered to pack everything until they get to the rink and remember they forgot to pack their undergear hanging in the laundry room. The same undergear they actually passed right by to get to the car where they told you they remembered to pack everything. Similar script applies to game jerseys – also hanging in the laundry room. This is a classic pre-tournament question. Once again, of course they finished their homework! They finished their homework so much so there was no need for their Biology teacher to email you on Monday morning informing you that your child was late with their Bio lab report. Naturally we want our kids to eat something healthy, especially before a big game or event. I am thinking back to a pre-tournament game in Cornwall a few years ago where the entire team dined at a local favourite, and highly recommended pizza place. Half the team was hunched over clutching their protesting cramped bellies during the game that immediately followed. Lesson learned. If I had been a little smarter in my early hockey momhood, I would’ve printed this off and just left it on the back door to serve as a silent reminder to my hockey players. That is, all but the last one. My ongoing encouragement shall be repeated often and shall remain timeless. Three cheers for persistent enlightenment – and the hockey moms who preach it!